After the 1950 trestle fire there was NO transit service to Rockaway Park OR to Far Rockaway. The LIRR stopped at Hamilton Beach, making stops at Ozone Park and Aqueduct Racetrack. After 1955, the LIRR terminated ALL their trains at Ozone Park until service was completely ended in 1962. In 1955, ownership of the LIRR's ROW and tracks from south of Ozone Park, across Jamaica Bay, eastward to Far Rockaway (Mott Ave.), and westward to Rockaway Park and all the stations in between was transferred to the NYCTA, who then rebuilt the trestle over Jamaica Bay in a more substantial manner, renovated some of the elevated stations along the line, installed their own signal system, tore up and rebuilt the Rockaway Park yard and terminal platforms and severed the elevated structure and tracks over Mott Ave., Far Rockaway, so as to allow no further connection with the LIRR's facilities on the east side of Mott Avenue. Dave Kelle research/photo collection. The city built a junction called Liberty Junction, at the BMT's Fulton Street line along Liberty Ave. just south of the LIRR's Ozone Park station, with the upper BMT EL line continuing eastward to Lefferts Blvd. and the lower IND EL line curving south and becoming their Rockaway line, running along the LIRR's former ROW from this point southwards, across the new Jamaica Bay trestle and curving off at what was once Hammel's wye with one line curving westward to Rockaway Park and one line curving eastward to Far Rockaway, Mott Ave., along the LIRR's former viaduct. 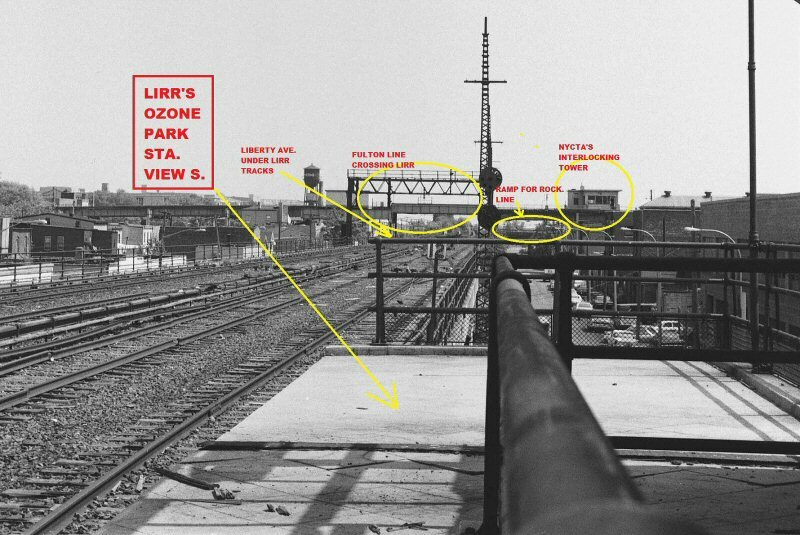 Thank you for posting that photo of Ozone Park station and the info from Steve Lynch. I was out and about taking photos on the A - Lefferts and took this picture of Ozone Park as of June 22, 2018. Nature is taking over. dieciduej wrote: I was out and about taking photos on the A - Lefferts and took this picture of Ozone Park as of June 22, 2018. Nature is taking over. To the original picture, the steel structure rising is the substation at the Broad Channel Station. It has the same two tier shape as what you see today. A scan of the original that I just donated to the Oyster Bay Railroad Museum. Has anyone here ever seen this item ? newkirk wrote: Has anyone here ever seen this item ? I’ve never seen this particular item before. jdheasy wrote: I’ve never seen this particular item before. Believe me, it looks as old as the scan. Not a reprint or hoax. Possibly the only one in existence ?